Back early 2012 I was planning my wedding to Neal, enjoying my job as a healthcare assistant and enjoying holidays in Marbella. However gradually I had gained 6 stone and had become depressed. 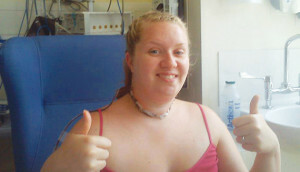 In July 2012, aged 23 I was diagnosed with papillary thyroid cancer after discovering a lump on my neck. I was extremely shocked as I felt armour plated and didn’t feel overly unwell as it was such a gradual decline. The worst thing about being told I had cancer was how I was going to tell the man I loved and my future husband. Weeks later, following my operation, a 4 day stint in intensive care and radioactive iodine treatment I was feeling pretty unwell. With Neal working a 48 hour week, we didn’t have a lot of time just the two of us. Neal, not having a health background, struggled to understand how cancer could affect every aspect of life. After meeting Georgie at the www.realshare.co.uk launch party, she invited Neal and I to come along to Youth Cancer Trust. Initially being almost a married couple we were concerned the holiday was going to be like a school trip, but we were so wrong!!! So in late October we made our way from Bristol to Bournemouth. As soon as we arrived we were made so welcome by Brenda and Jim. During our week we had the opportunity to take part in activities such as bowling, go-karting, pizza night and swimming at the hotel next door, but most importantly Neal and I had the opportunity to spend much needed quality time together. We had the time to walk to the beach, walk or drive into the town centre and of course we had time to pop to the local pub. On our week away we met some lovely people and definitely made some friends for life. Our time at YCT helped Neal understand that I was not the only one who had ups and downs, fatigue, nausea etc. Neal also made friends with the other young people who spoke to Neal about their experiences of cancer. Things about my treatment and cancer journey started to make more sense to him. Our week at Youth Cancer Trust was a massive turn round point in my cancer journey. At times I was struggling for Neal to understand what I was going through post treatment, yet from Neal speaking to others in similar situations as me, he began to empathise with me and what I was going through.